Setting up for Sign-On is just so easy to do in Majestri. Below are the simple steps to follow to make sure that you're ready to go nice and early and can open the registration gates weeks before Sign-On Day even occurs. If this is the first event you're setting up on your Majestri site, please make sure that you've read through our Early Housekeeping guide to make sure you've got all the pieces are in place to make sure that your club and our company work together like ebony and ivory. Fill in the fields on the popup that will appear. The Season event type is for your yearly registrations, and generally, you can use Mini-Events for a variety of other purposes throughout the year. 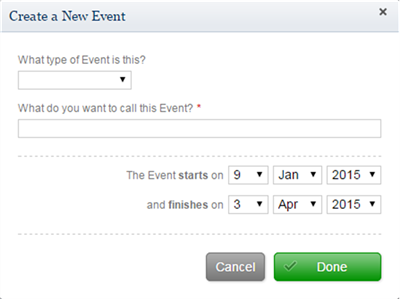 If you have something very particular, then contact us and we'll discuss whether to create a new event type. The popup will show you what information is captured for each person who will appear on the registration form. We're happy to do a little bit of customisation here to help you out, so if you would like fields added or removed, send us an email at support@majestri.com.au and we'll get you sorted. Need to know how to attach your fees to the event you're creating? Check out our little primer that'll walk you through the process. The great thing about opening an event for people to register for, is that it's a great little opportunity for you to get your online shop back in front of their eyes so you can tempt them with your wares. If you've got products, the shop will appear as the next screen after your punters have filled in their event registration details. Nobody can resist adding a couple of little goodies to the cart before checkout. Building out the shop is one of the easiest things to do in Majestri, which really does say something. This little guide is always there for you, should you get stuck.